Will get One Year Warranty for all items from our company. 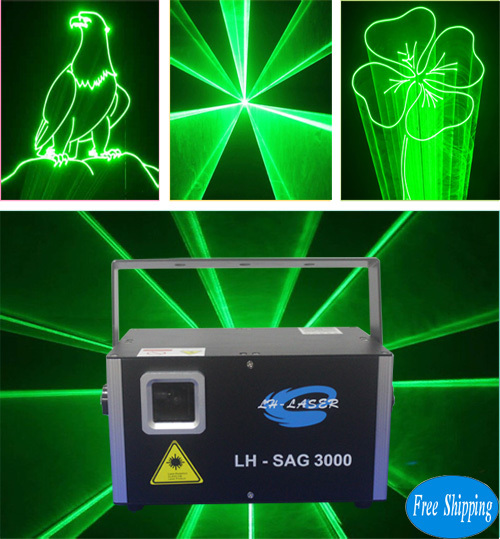 1).3D/Fireworks Belong to TTL Laser. But 3D laser have 3D Effects Mirror inside, Fireworks laser have Fireworks Effects Mirror insid, TTL/Analog Laser No Effects Mirror inside. 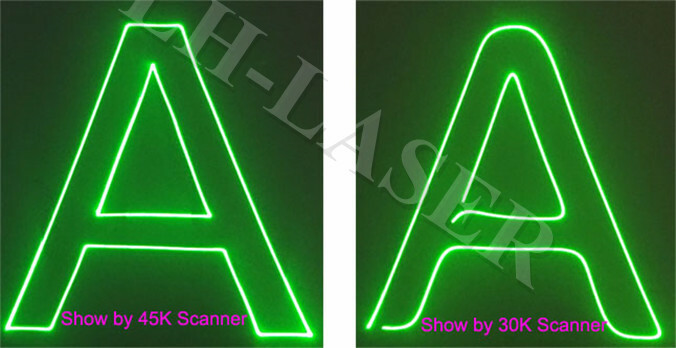 2).a:3D/Fireworks/TTL Laser have 7 colors (RGB/Full Color) and you can see the different color clearly seperated. ishow3.0/quickshow/LD2000 professional laser software with your computer and Analog laser and select Analog Mode from Laser software. If not, you can not see the difference between TTL and Analog (TTL=Analog). 1.We have two scanner speed: 0-30K and 0-45K. a.When you show animations or texts effects, it will much fluently and little flicker. b.When show a texts, laser will show out much completely, neatly and perfectly texts effects, like the photo as follows. c.If most of time, you just need beam effects, so suggest 0-30K laser, if need for texts, animations, logos,advertising, suggest 0-45K laser. 1.449 Pcs Animations for free in SD Card, and about 200 pcs in Laser, so the total is More Than 649 Pcs Animations or beam effect for free. 2.There are 4 kinds of Language in LCD Screen: Chinese (Simple and Complex Chinese), English, Japanese, Korean. 3.Ishow software and 4G SD Card For Free (In SD Card) You can design your own programs with Ishow,such as Pictures, Logo, Animations and then Copy it to SD Card which inserted into laser. 4.Originate from High-Speed Scanning System with Germany Technology. 0-30Kpps / 0-45Kpps can be selected from Lcd display. 5.Light outlet with professional Coating glass, Dustproof design and Safe Key switch will reduce the power loss and frequency of maintenance. 6.Supporting Auto play of texts and aniamtion with changing color random. 7.Ishow Software just suitable for Windows XP and Windows 7 32bits,But not for Windows 7 64 bits and Windows 8. From here, You can see if you want, you can transfer 2640pcs Effects into 4G SD Card from Ishow, but as a professional seller, Do not suggest transfer too much effects into 4G SD Card, you can transfer what you want &like. Blue-Ocean Technology(HK)Co.,Ltd registered in Hongkong.a sales department there.Registered European Trademark (No.015379472). Our Manufature Company is"shenzhen Huatelai Photo-Electric Co.,Ltd".Registered in Shenzhen City,China Mainland.Our Logo is"LH-LASER".